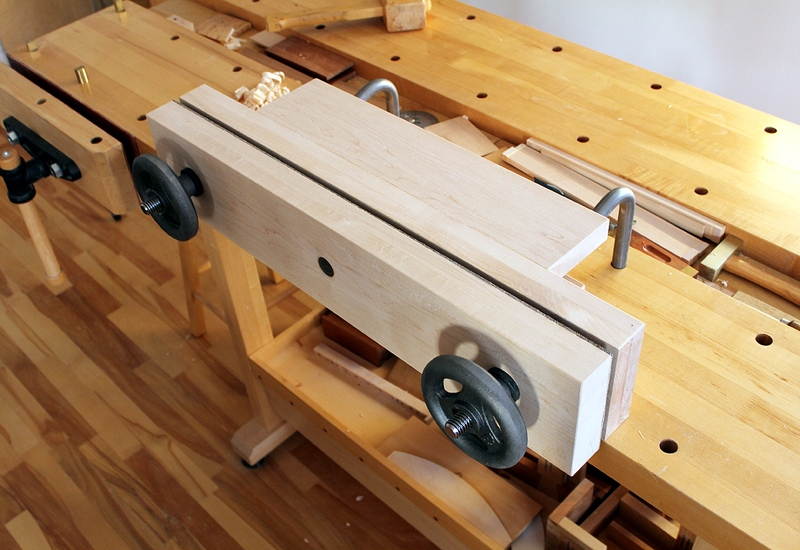 Follow our Moxon vise plan and build your own portable Moxon twin-screw vise. The portable Moxon vise is designed to hold work above the standard height of a workbench. The Moxon vise design is widely attributed to a Joseph Moxon. Joseph Moxon (1627 – 1691), was the hydrographer to Charles II English printer specialising in mathematical books and maps. Moxon’s 17th century book The Art of Joinery first described the double-screw vise. In this historical publication the Moxon vise was documented – a double-screw held to a workbench top with clamps or holdfasts in order to facilitate certain work. A regular bench height at 35-36 inches is optimized for handplaning operations. When performing fine sawing and other detail work, a higher work surface is preferred. An elevated height of the workpiece enables you to have a clearer view of the wood that is being sawn. Instead of having to stoop down to a workpiece on a regular height workbench, the Moxon vise raises the height of the workpiece to where it is comfortable to work on without strain. You will also be able to easily clamp long, wide panels to the side of a workbench using this vise. The Moxon vise is designed to be both versatile and portable. It can be placed anywhere on a workbench top where dog holes are accessible. When not in use, the Moxon vise can easily be stored upright against a wall. A normal bench height is in the area of 35-36 inches. With the Moxon vise clamped on to the surface of the workbench, an increased height of 41 inches is achieved. The additional height is a game changer when performing detail work. This Moxon vise design also has a small table set up as an extension in the rear. The small table can be used for mallet work and to rest tools. 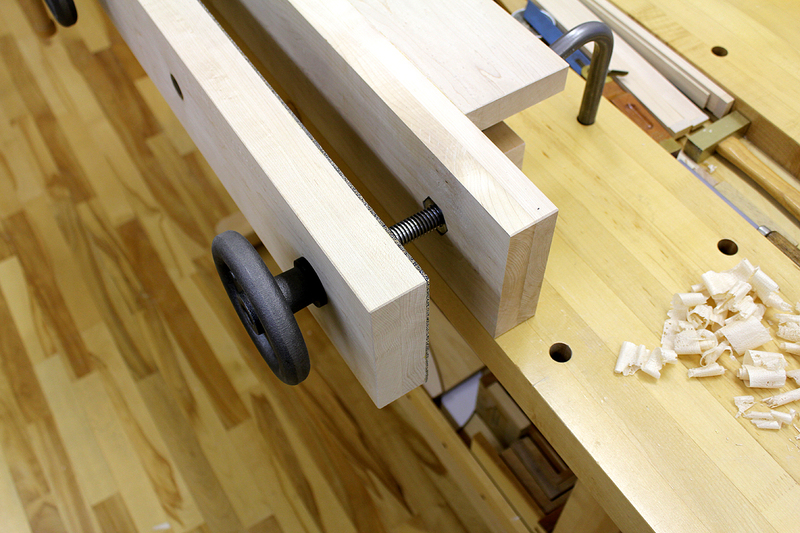 This Moxon vise design is attached to the workbench top using holdfasts and dog holes. Holdfasts excel at quickly clamping down jigs and workpieces to a workbench surface. The Moxon vise has been adapted to allow for holdfasts to clamp it down as can be seen in these images. Alternative methods exist to clamp a Moxon vise to a workbench, but this is the quickest, cleanest and most unobtrusive method. Although the hardware and holdfasts used in this Moxon vise build is off the shelf, the plan can be modified for your own hardware and your own holdfasts. Once you have an understanding of Moxon vise concepts, adapting the design to suit your specific work methods is entirely possible. Comprehensive information, Moxon vise techniques and video, large photos and (14) detailed computer designed diagrams (CAD) included with the Moxon vise plan purchase. Images, video and illustrations of attaching the Moxon vise to a workbench are also included. This entry was posted in Plans by Norman Pirollo. Bookmark the permalink.